This story is hilarious. 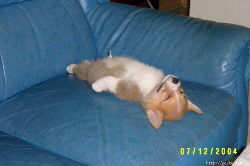 I feel like that dog, but am wide awake. Oh Bonnie STOP!!! Before I came to your site, I was grinning and wondering what in the world it would be today. lol!!! I needed a laugh! Funny, Bonnie, a great joke to share. The little dog must be one of my dog's (Bug), unknown about sons from when Bug was still a stray. Same favorite position. oswlaThe poor pooch looks like I feel.